Trusted Nationwide For Over 25 Years! Trusted by individuals and large organisations such as BMW, Primark, and Rolls Royce. Spray Foam Insulation - the safer and faster solution for trench breakers and water stops. The alternative to costly re-roofing. Spray Foam Insulation – Polyurethane Foam and Condensation Specialists. Foam Spray Insulation Ltd is a professional insulation company which has been trading for over 25 years. Based in the heart of the UK with a highly experienced team of applicators, each with many years’ experience within the spray foam insulation industry. We have worked on varied projects within the UK and overseas. Our aim remains the same, to provide the highest standards of quality and service to our customers. Spray Foam Insulation is considered to be one of the most versatile forms of insulation available. Its continuous membrane, which can adhere to virtually any building or structure, including awkward shapes such as curves and voids, contains the most efficient insulating properties used in modern industry. It can weatherproof and stabilise structures thereby extending the life of many old buildings. Foam Spray Insulation, provides an extremely high performance insulation that meets with all current building regulations at a very competitive price. All the materials we use are manufactured in the UK by Isothane Ltd, the UK market leaders in the production of polyurethane foam systems. Where can Foam Spray be Used? Foam spray has experience applying and installing spray foam roof insulation. Heat naturally rises up through a building, which is why the first and second floors tend to be warmer than the ground floor or basements. This means, however, that it’s vital your roof is insulated. This is one of the key places that heat will escape. 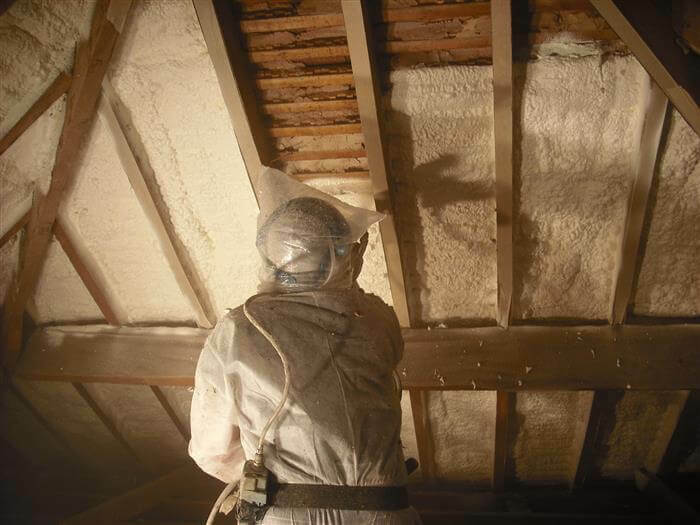 Spray foam loft insulation is a key way to protect your home from heat loss, reducing energy bills and helping the environment. However, lofts can be a precious area for storage or even living space. Filling your loft with traditional forms of insulation means the space can no longer be used easily. Foam spray is the perfect way to insulate your loft. Just a few millimeters of foam insulation is all it takes to provide effective insulation. Foam cavity wall insulation is a popular and effective way to insulate the walls of your home or property. Heat often escapes through walls when the internal temperature of the room is warmer than that outside — which is most of the year in the UK! Foam spray insulation is the perfect way to prevent heat loss in your cavity walls.